A third of children in Southwest are estimated to live in poverty. 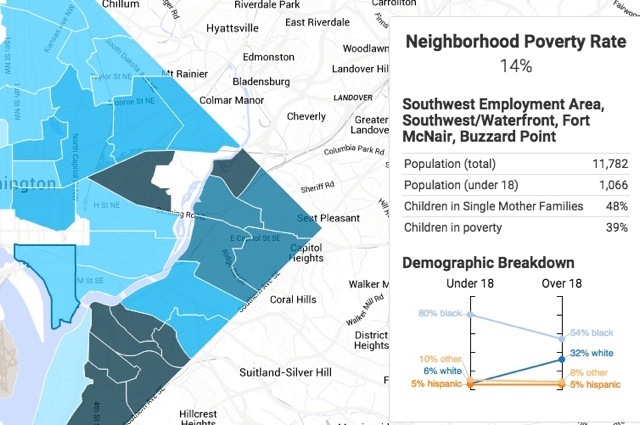 Interactive maps released today by the nonprofit D.C. Action for Children show estimated poverty rates and math and reading proficiency rates for children in neighborhoods across the District. About 20 percent of children under age 17 in the neighborhood designated as Capitol Hill/Lincoln Park live below the federal poverty line, according to the map made using 2009-2013 Census Bureau data. An estimated 16 percent of youth in the Union Station/Stanton Park/Kingman Park area live in poverty. The youth poverty rate in Near Southeast/Navy Yard was estimated at 8 percent. The maps also show two “neighborhood child success indicators” — the percentage of students who scored as proficient or above in reading and in math, tabulated according to the neighborhood where they live. Data provided by the Office of the State Superintendent of Education shows that Southwest had the lowest indicators in Ward 6 for the 2012-2013 school year, with 48 percent of students scoring as proficient in math and 42 percent in reading. Half of students in the Near Southeast area scored as proficient in math, and 36 percent did in reading. Fifty-four percent of students in the Union Station area scored as proficient or higher in math, and 50 percent did in reading. And the Capitol Hill area scored highest, with 54 percent scoring proficient or better in math, and 59 percent in reading. The full data visualizations are available on the D.C. Action for Children website.